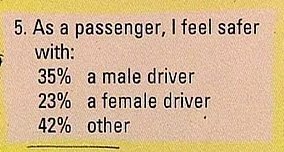 It appears SGI's opinion of transgender driving is the majority. lmao. That is so true though. You get the precision of a male with the caution of a female. GO SARAH!!!!!!!!!!!!! you can drive with me as a passenger anytime.